Find out how the Les Justices branch of the “Super U” supermarket in Angers adopted the Price Tag solution to harmonize its display labeling. In the mass distribution field, the price fluctuation, the products’ origin and the variation of supplies complicate price tags ‘update for the food products. In order to streamline the price tags’ management, a supermarkets’ director has set up an innovating solution. 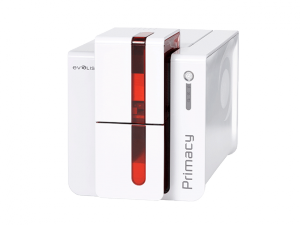 Using the Primacy plastic card printer provides to the section’s sellers many advantages to update on daily basis. 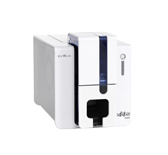 Very compact, the printer is set up close to the counter and provides an instant update. Thanks to the integrated database, Primacy provides an important time-saving where the modifications are computerized right before the printing. Front: Besides, the denomination of the product and the price, the display includes the scientific name of the fish in Latin, the fishing method used as well as the geographical fishing area; all of this in accordance with the European regulation. Back: For the seller, many useful information can be printed such as a barcode or a price look up code for an immediate capture on the scale. The solution enables the teams a real time-saving every day, whether in the updating or in the tag’s cleaning. The plastic card has a smooth surface that ensures a complete hygiene. In March 2017, Evolis has launched three new all-in-one solutions for price labeling on plastic cards that meet the diverse needs of small, independent food retailers up to large retail outlets. 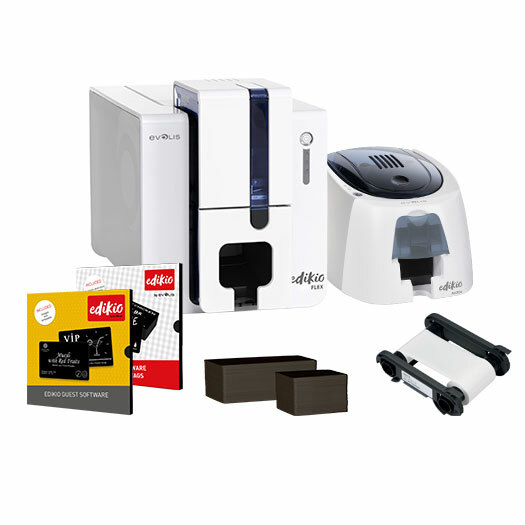 All Edikio solutions are comprised of card design software, a card printer, blank plastic cards and a print ribbon, enabling cards to be printed quickly and independently onto a plastic card. Price tags can thus be created at any time, directly at the point of sale, individually or in batches. 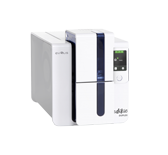 Edikio Access, the affordable solution for single-sided card printing in credit card format for small volumes. Edikio Flex, the flexible solution for printing price tags in long format as well as credit card format to fit different display needs. 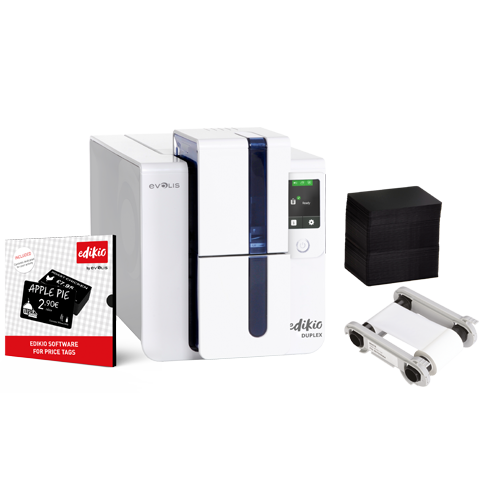 Edikio Duplex, the advanced solution for double-sided and high-volume card printing. 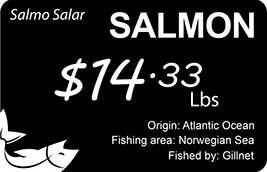 The reverse side allows for the display of information dedicated to the sales staff. The printer operates just as easily as an office printer. The plastic cards and the print ribbon included in the Edikio pack are installed in a single gesture. Download full article (PDF) Where to buy? 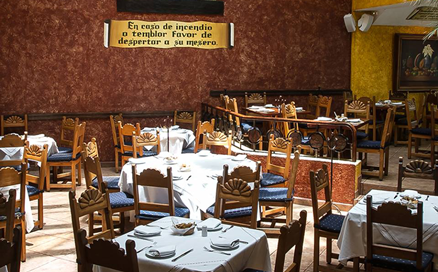 The restaurant Villa Maria in Mexico City offers mugs, cooking books, and other small objects for sale. 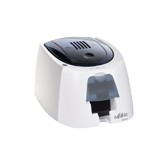 The all-in-one solution Edikio Price Tag helps the employees to create and print elegant price tags within a couple of minutes. 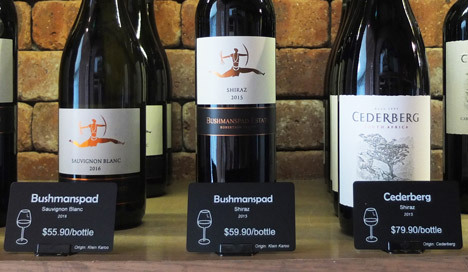 The Wine Company, based in Singapore, prints 40 to 50 new price tags cards each month. Manage efficiently and quickly daily issuance of price tags at the point of sale. 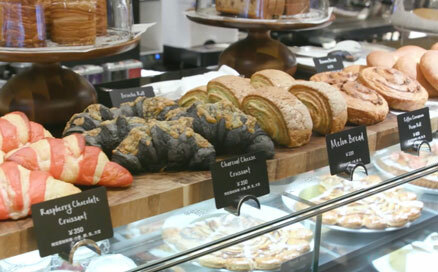 An easy and qualitative printing solution for elegant price tags in bakeries. Price tag printing in accordance with European regulations on food information labeling for consumers on fresh produce. Streamlined management of food tags displayed in the restaurants and coffee shops of several ships with the Primacy plastic card printer. 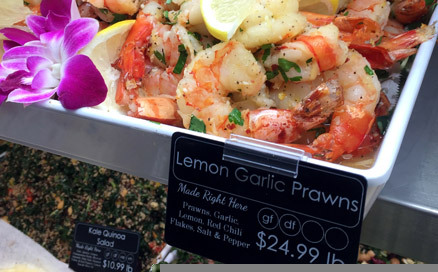 Over 14,000 establishments are already using Edikio's labeling solutions. Why not join them? Find a reseller near you! Want to replace your price tags ? Interested in creating more attractive buffet layouts and dining spaces?